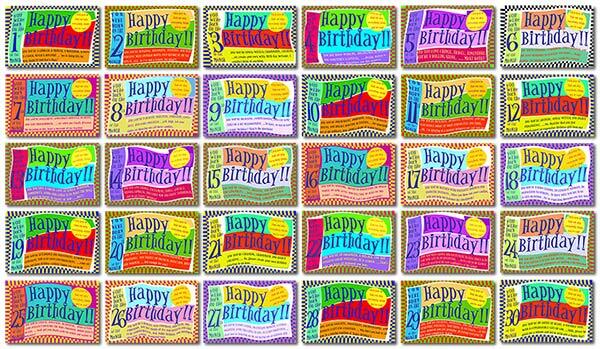 Your Birthday number is one of five core numbers in your numerology reading. Your Birthday number is simply the day of your birth. This number is not reduced. Each of the 31 birth days is described separately. Select Your Birthday and learn about yourself! Can Numerology predict health problems, financial difficulties, accidents, and other potential problems? Certain cycles definitely point to the possibility of painful experiences at certain times in your life, such as accidents, money problems, divorce, and the like. In the same way, it foretells many positive events. However, numerology teaches us that at such times the person always has the opportunity to turn the course of events in his favor, or to let a beautiful opportunity slide by. It can indicate, for example, that a certain period of your life will be highly rewarding, a kind of payment for years of effort. It can be very accurate in such predictions. The rewards are comparable to the effort you have made. Little effort brings small rewards; great effort brings great rewards. In the same way, it reveals the sowing and the harvesting cycles of life. If you have sown seeds of selfishness and greed, you will experience a time of loss — financial loss, or the loss of support from others. Your numerology chart reveals your potential, your strengths, your weaknesses, your challenges, and your lessons to be learned. Every number in your numerology chart suggests potential strengths and weaknesses; all things have their light and dark sides. It is you freedom as an individual to draw from your highest potential,. A numerologist can have a good idea of which direction a person will likely move in, and how much of his potential he will use or abuse. This is known by considering the balance of a chart, or the spreading of energies; by far the biggest challenge even after many years of experience. Or, if you are up to it, dive in and learn numerology; become a professional numerologist and perhaps start a numerology business.